The Dimplex Cheriton electric fire is a fire to be desired. 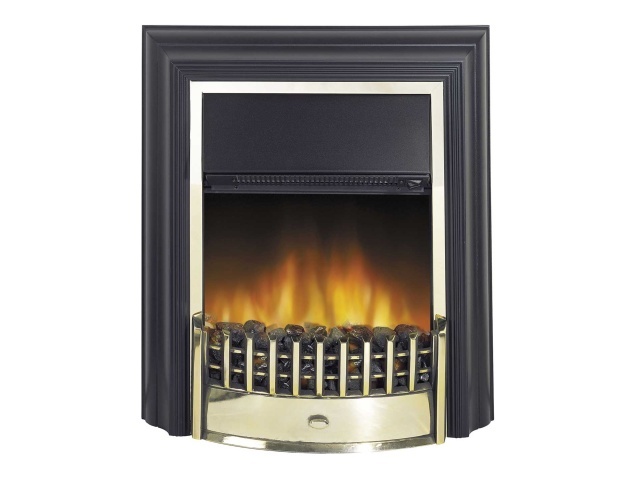 Featuring the well-known optiflame flame effect and coal fuel bed this fire has a traditional feel to it. The fire is a perfect companion to your wooden, marble or stone fireplace which will complete that warm and homely look that you are after. 1 hours 6 minutes to go! The fire has no effect or the effect has changed in appearance.? Ensure mains switch is switched on. Check the fuse is OK and circuit breaker is also on. If the effect motor is still operating and heat is available, the lamps may have failed. Check and replace bulbs if necessary. The fire has no heat.? Ensure mains switch is switched on. Check the fuse is OK and circuit breaker is also on. Check the heat selector switches are switched on. If the fire has a thermostat check that this is not on the lower settings. If the room is warm enough, the thermostat will stop the fire switching the heat on. You could also check if the fire has been inadvertently covered in which case the safety cut-out may have operated? Switch your fire off, leave for 2 minutes and then switch back on. The heat cuts out after short period of time.? If the fire has a thermostat, check that this is not on the lower settings. If the room is warm enough, the thermostat will stop the fire switching the heat on. The remote control is not operating correctly.? If the fire is operative on manual but the remote is not working then simply check or replace batteries. Is there any more information about this fire? The bulb in my Dimplex Stove has stopped working. Can I replace it? Yes, you can simply replace the bulb with an equivalent energy saving model that you can purchase from your local DIY store. Are the plugs easily accessible if plugged in behind the fire? Fires must not be plugged in anywhere behind the surround or the fire. The plug must remain accessible after installation to allow the fire to be isolated in an emergency. Great fire. Would recommend to all. Customer service excellent. Great purchase, prompt delivery. Appreciated the excellent workmanship of the recommended gas engineer. I am very pleased with the purchase. Will recommend this site to collegues and family. Great customer service...very good price...very pleased with my purchase...would recommend to all. Best delivery arrangements ever, very fast - was given a 1 hour time slot and was able to track the location of the delivery van. I am so pleased with the Dimplex Cheriton fire, the flame effect is realistic and cosy looking and gives my living room a focal point. Best price too. The service received from this company was excellent - definitely recommended.